My first Father’s Day, as a father, was on June 18, 1995. We were at my sister’s house in Virginia for some reason that none of us can now recall, and Corey Pavin won the U.S. Open at Shinnecock Hills Golf Club in Southampton, New York. The Open is back at Shinnecock this year, and I will likely see more of Pavin’s final round through replays this week than I actually saw twenty-three years ago. My older son will also. He was only four months old in 1995, and I don’t recall him paying attention to important things on TV just yet. That I am able to fondly remember that day surprises me. It turns out Father’s Days in America are memorable. Thursday’s episode of The Daily, the New York Times podcast, featured an interview with a woman using the alias “Mariam.” She is in America as a result of being granted asylum. She fled the African nation, Burkina Faso, to escape a horrific experience with domestic violence based on a dowry system. Earlier this week, Attorney General Jeff Sessions announced the end of our nation’s rule to grant foreign victims of domestic violence asylum here. Mariam would have been sent back, if she had arrived at JFK this week instead of two years ago. Had she arrived with children this week, Sessions would likely have also instructed U.S. Immigration and Customs Enforcement (ICE) to separate and detain them. I wonder what families in Burkina Faso do to celebrate their nation’s dads. More importantly, if they don’t take care of the kids, for what reason should they even be celebrated? So, welcome back to Father’s Day in America. Both of my sons were at my house Wednesday night and they will both be here on Sunday. We will watch a few hours of golf, grill out, take naps, and repeat. That sounds pretty boring when it is written down like that, but it’s not to me. And it is what my dad would want to do too. If he were still here. Love it or not, there is no denying that golf is time consuming. Fewer and fewer people are willing to sacrifice four or five hours for a round of golf these days. I try to keep my game in shape and even I think it just takes too damn much time. Except when time is all you really wanted in the first place. 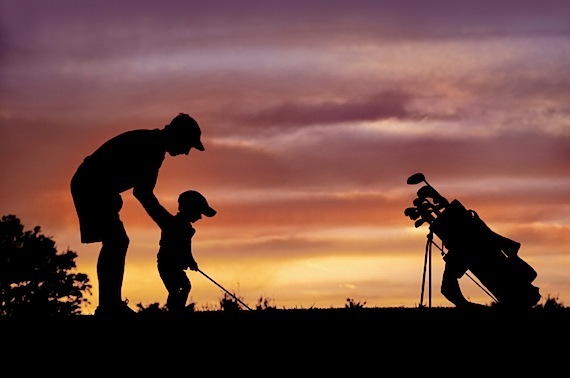 We are a golf family. I married into a golf family. My wife is celebrating Father’s Day early by playing golf with her dad and his buddies on Saturday. They get to spend some quality time together, and he gets to show off his daughter’s superior golf skills to a bunch of has-beens. In the last month, our nation has celebrated its moms, and now its dads. We honor them as the foundation of family here and we look to them as the primary source for our culture’s progress. The “breakdown of the family” that my dad used to holler about when I was young, I hear echoed by others almost daily in adult life. And for myriad reasons. Not all of us are mothers or fathers. I am a dad, though my boys don’t need me most days anymore. But being a dad has defined my life, and so I need to behave more like a parent even when my kids aren’t around. A country of parents would never turn Mariam away. That would not be the solution to the problem her arrival presented. Not to a parentally-minded country. Children would not be separated from parents who are desperately bringing their families here to survive. Especially not as a policy. My dad did not talk about politics much. He would have talked about this stuff though. He would have said there is no reason the richest country on the planet should even think about treating other human beings this badly. I can hear his voice, even though he’s gone. Golf will take up most of the day for my family on Sunday. Let’s face it–it’s a good excuse to waste a day with my boys, and for them to waste one with me. And since neither of them read my column, its a great opportunity for a good long dad-talk about some key differences between what is right and what is wrong.